Eugene Laverty rode the Team Go Eleven Ducati V4 R for the first time at Jerez in Spain. Eugene Laverty was all smiles after the Northern Ireland rider had the chance to get a feel for his new Ducati at Jerez in Spain on Wednesday. The 32-year-old, who has joined Team Go Eleven to ride the all-new V4 R, used the opening day of the World Superbike test to familiarise himself with the Italian machine, but nonetheless Laverty signed off feeling ‘very impressed’. He intends to push the limits more on Thursday as the two-day test concludes, before travelling on to Portimao in Portugal for a further two days of testing on Sunday and Monday. “Day one here in Jerez has really been a day for me to understand the bike and get comfortable, and also for my new team, Go Eleven, to understand the new Ducati V4 R,” Laverty said. “The plan was only to make 30 or 35 laps and that’s what we did and I’m happy with the work we did. Now the plan for tomorrow is to push a little bit more for performance. “The first laps on the bike, I was very impressed. The gearbox is so smooth and it really felt like a race bike, so the first impressions were good,” he added. “It’s the first time I’ve been in a one-rider team so in one instance that feels strange, but it’s nice that everybody is concentrated on me and just one bike. Laverty, who finished as the championship runner-up in 2013, says he is hungry to rediscover the winning feeling again, with almost five years passing since his last World Superbike victory at Phillip Island in 2014. “It’s very early to make goals at this stage but like every rider I want to win races because it’s been too long, almost five years since I won a race in Phillip Island, so I really want to return to that top step of the podium and the sooner the better,” Laverty said. He finished 14th fastest on the unofficial time sheets at Jerez, lapping in 1m 43.376s. British rider Alex Lowes led the way on the Pata Yamaha with a lap in 1m 40.442s, which put him only 0.08s ahead of reigning champion Jonathan Rea (Kawasaki). 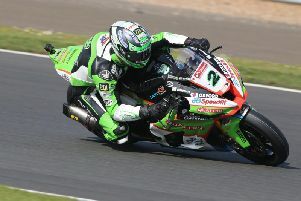 Leon Haslam was third fastest (1m 40.877s) on the second of the KRT machines.